Most of these dances are figured dances connected to music, mainly based on polka and waltz rythms. You will also try crazy, energetic dances. And if you find some new figures to add to your balfolk dance’s repertoire, please try them! These dances are quiet, calm and deeply grounded. They come from different parts of Norway, one from north Roros (Pols) and other from West coast (Rudl). Both dances require a lot of balance. Try them and have fun! He’s a musician and a dance teacher. Dancing from young age, he learned dances from his mother and various folk ensembles. For one year he improved his dance skills in Norway. 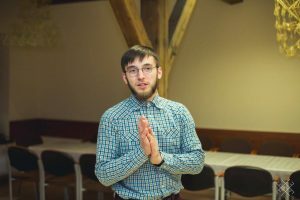 After returning to his homeland, he paid a lot of attention to analysing Lithuanian folk repertoires with the aim to strengthen his tradition and dance technique knowledge. His dance teaching style is based on his apprenticeships in other countries and long-lasting dancing experience. He learned to play music by himself and mostly improved his skills during dance events. He plays two row-button accordions and bandoneons, either alone or with friends. Now he leads TŠK of Vilnius, teaching dances and playing during parties. Fandango is no doubt the most known basque dance, either in Basque country and abroad. It’s a couple dance on a triple time rithm, based on a cycle of moving closer and farther from each other, with a frantic legs and feet movement. Fandango is spread all over Basque country and its variations differ from region to region: there are variations in the movements sequence, step style, floor striking technique and dancers bearing. Bilaka will introduce one of the easiest fandango versions, that is from their own region: Labourd – where Bayonne e Biarritz are placed. You will discover a first easy version of steps and movements sequence. Thus, you will be able to embark with no fears on your first fandango! Mutxiko, Basque jumps, is a family of social traditional dances widely spread in the Basque country, where every fair is an occasion to dance. Danced in a circle, these dances are made of an unordered sequence of steps with no special pattern or meaning. To make the dance accessible to everyone, the steps are often announced on the music rythm. An initiation workshop will be given by Bilaka members, to let you discover the main mutxiko steps, along with their names and technical details, granting you the chance to enjoy and share different basque dances. Traditional dance in Sardinia is certainly one of the most interesting aspects of local culture, especially in the inland areas. It is a rich range of choreutical forms, musical structures and contexts of execution. Somewhat diversified in respect to the area of origin, Sardinian dances certainly have in common their particular posture, which allows to keep the torso rigid enough for freeing the lower part of the body, that can perform all variations and embellishments peculiar to each dance. Originally they were executed in a circle, which confirms their religious origin, but currently the dancers, tight in solid “grip”, alternate circle dance with couple dance, or in a chain, even made only by men or women. This workshop will deal with various aspects of the Sardinian dance and of the culture in which it is developed. Starting from its origins and its evolution over time, we will focus on the analysis of the dances, examine various musical aspects and the instruments used to accompany it, take into account its diffusion in the territory. Both those who have no knowledge of the Sardinian dances and those who intend to deepen them can participate. The workshop focuses on the dancing tradition from Apulia: Pizzica Pizzica. Starting with a historical contextualisation, we’ll explore the rhythms and the basic movements, and then we will go deeper into the dynamic relations, the circular dancing space, the important connection between sound and movement, the rhythmical and choreutical differences between Upper and Lower Salento. The dancing lesson will be accompanied by live played music. Paola Perrone, born in Calabria, follows a parallel dancing and university formation path, with the graduation thesis in the subject History of dancing and miming in 2005 at the Alma Mater Studiorum (University of Bologna). In 2008 she begins learning italian popular dances at the TarantArte academy (at first in Taranta Power) under the artistic direction of the choreographer Maristella Martella. Perrone becomes a member of Martella’s dancing company, taking part in many performances throughout Italy. As dancer, she collaborates in several music groups and, as teacher, she gives workshops to adults and children in Bologna (Baraccano Theater, Danz’Aire Academy, Museum of The Music in Bologna) and all over the national territory. The workshop is suitable for all levels: beginners, don’t be afraid, you are welcome! The practical lesson develops on experiencing the dances from the Savena Valley, near Bologna, giving indications about the important communicative meaning, which the several gestures, steps and postures do have. Placida Staro, also called Dina, is an internationally famed ethnomusicologist and ethnochoreologist, also a fiddler and singer of the Suonatori della Valle del Savena. This workshop includes the whole Romagna’s dance repertoire from the seaside to the mountains: from traditional saltarelli (jumping steps), in two facing lines of three couples, to the cheerful circle dances called manfrina, from couple dances to an interesting and fun version of quadriglia. He began practising folk dances in the early 90s attending workshops, courses and festivals held by the best teachers of that time. In 1996 he joined the culture association L’Uva Grisa in Bellaria (Rimini) with which he started a lifelong research on folk culture of Romagna. There he soon became a dance teacher. He’s now Chairman of Culture Association Fermento Etnico (Ethnical Yeast). Its main purpose is enhancing folk traditions of several areas creating, promoting and setting up events and initiatives in this field. 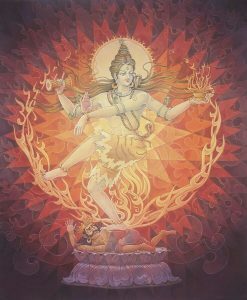 God Shiva, in one of his representations, is Nataraja, the master of dance who squashes “ignorance” under his feet. At the same time he is the perfect yogi, immersed in neverending blessing and samadhi. Hata yoga starts from the lowest level, the absolute perception of our phisical, “gross” body, a basic starting point in dance, to lead the pupils up to the superconsciousness stages. Salvo Angelico approached yoga very early in his life and began his learning in the well known Accademia Yoga in Rome. While deepening his knowledge in hata yoga he also studied tantric yoga and kashmir shivaism. After several years of deep practice, he got a teacher diploma in India at the Yoga Vidya Gurukulamî Ashram held by Swami Ananda Saraswati.